When Ram Das was born, a warm breeze rose in the southern sky and the birds with ruffled feathers sang their morning song. They woke the sleeping sun with their clear-throated chorus. The first golden rays reached the window, then drifted across the floor to find the feet of the baby boy, and then very politely hovered on his eyelids. His mother, named Mercy, smiled with soft breath; Ram Das opened his eyes and the stars blinked. Fairies tapped on the window like yellow bees. He was his parent’s only son, so they named him Jetha, first born. Their joy flowed as his little laugh spilled out of the door, rolled down the stairs into the courtyard, headed down the street and out into the fields where the wild flowers shook their blossoms with delight. As a young boy, Jetha listened to the whisper of the wind singing God’s name, on a current of sound only he could hear. No negative word passed his lips, and whenever people passed him they turned their heads to see his dark, dancing eyes. His parents were too poor to buy shoes, so he walked barefoot, but the stones refused to cut his feet. 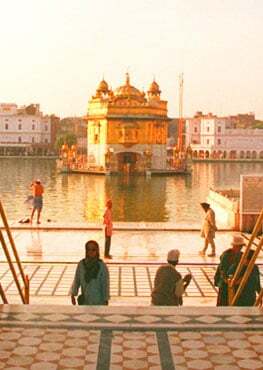 One day he heard singing by the bank of the river, and his lotus feet followed the sound. People were chanting the songs of Guru Nanak and the words drew him close, enraptured, alive. He found a home in Guru Nanak’s lyric mansion, and he joined these Sikhs to be with God’s immortal slave, Guru Amar Das. Guru Amar Das had a daughter with a face as round and bright as the full moon. When Bibi Bhani married Jetha, the deer showed their faces through the leaves at the edge of the meadow. A rainbow encircled the sun by day, and a halo clung to the moon by night. Three children were born, and the greatest was Arjun Mal who loved his father like a saint. Jetha stayed close to Guru Amar Das which made his countenance brighten with love. His features were tinged with crimson and no shadow could darken his face. His devotion was pure, faithful, without hesitation. As a man Jetha loved every creature and God marvelled in heaven. Where he walked grass grew and turned forest green. He served God alone and Guru Amar Das crowned him Guru Ram Das, the fourth Guru. People came from all around who were sick, afraid, in doubt. Guru Ram Das gave his healing touch to all; his words washed away their grief, their pain, their horrible disease. Then he built a pool – carrying away the earth between his hands – so after he was gone people could heal themselves in water that held the nectar of God’s name. When he died, little blue flowers fell from heaven and floated on the water’s surface turning it azure blue. Goldfish rose from the bottom to eat them. The birds swooped low to swallow them. And the people reached out to gather them in cupped hands and breathe the fragrance. The water dripped through their fingers and every drop said ‘Dhan Dhan’ as it fell and merged in the pool of peace. Guru Ram Das composed poems in his heart and his words turned to seeds which sprouted in the ears of his listeners, sending roots into the soul. His lullaby puts children to sleep; his meditation puts thoughts to rest. The heavens rejoice in his tune that sounds in space. His son became Arjun the Guru because he wrote love letters that moved his father’s heart and made the earth weep for rain. Listen to the wind, and the rivers in your body. Call on Guru Ram Das by name with eyes open or closed and wait. He will come to you and heal your heart.